MySQL powers many of the social networks of Web 2.0. While it's great that we constitute one of the tools of Web 2.0, we should also ourselves utilise the tools Web 2.0 provides for social networking. Comparing myself to colleagues, I feel like a slow follower in this discipline. "Everybody else" is already on Twitter, has hundreds and hundreds of contacts on LinkedIn, Xing and Facebook, puts their pics on Picasa and Flickr, bookmarks their pages on del.icio.us, and has fancy blogs that are registered everywhere. Myself, I have been half-heartedly entering contacts into LinkedIn, I have mismanaged my Xing account, I uploaded a tiny amount of pictures on Flickr two years ago, and have now taken my first steps trying out Twitter and Picasa. I'm not even registered on Facebook or del.icio.us. And therefore I thought I would take a look at how to improve my online manners. So what I'll do over the next two months or so is to take a look at both the websites I've been mismanaging, and the new ones others have invited me to. I'll do my best to fit in, but I'll also come with some subjective commentary on what I experienced. First in line is Dopplr, the social network for travellers. I got invited to Dopplr by David Axmark in September 2007. I didn't do anything with the invitation, as there were "other more important things to do". In December 2007, I got invited by Giuseppe Maxia. One would think that these two invitations would have triggered me to do something about it, but no. I waited until I had to fix a complex set of travel involving David replacing myself in Japan so that I could go to South Africa. At the same time, I was asking Giuseppe about his travel plans and felt silly I had to ask and re-ask Giuseppe only because finding the relevant, freshest email was too cumbersome. That was the trigger that made me accept Giuseppe's Dopplr invitation. So I entered my basic data, which didn't take many minutes. 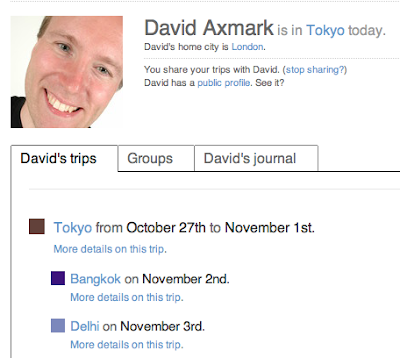 I could then see David's and Giuseppe's travel profiles, conveniently available under http://www.dopplr.com/ traveller/DavidAxmark and http://www.dopplr.com/traveller/gmaxia respectively. Looking at the right hand side on David's data from today, it's easy to see when he is where. I don't need to ask him, nor does anyone else. Next, I entered my travel plans for the rest of the year. Then, from my own itinerary, I noted something I hadn't thought of. On the way back from Buenos Aires, I have a stopover in Frankfurt, which happens to coincide with when Giuseppe is there for a meeting. If the stopover is long enough, or Giuseppe has extra time to come to the airport, we might meet just because we happen to be in the same place at the same time. And that's what Doppler is a lot about: Facilitating serendipitous meetings with people you know. Next, I saw all the cool stats that Giuseppe and David had, based on having joined Dopplr a lot earlier. So I entered my 2008 travel, which took quite a while as I've travelled a lot and emitted carbon in a most horrible way. 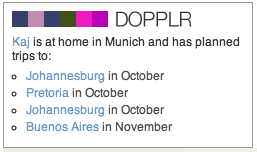 But it didn't help -- Dopplr still said I had travelled "0 km so far". All that data entry in vain! Too bad. I also have learnt that I'm as fast as a squirrel, with an average speed of 22,93 km/h. And this brings me to my first frustration with Dopplr. It tells me I've frequently been to "Nauvo". No, no, no! I most certainly refer to the place I've been to as "Nagu", not "Nauvo". It's a place with two names, of which in this case, I happen to use the same name as the majority of people living there. In the case of the second-most frequently visited place, I personally use "Helsingfors" (the Swedish name), but I can understand most people would use "Helsinki" (Finnish). And again, on fourth place, I've got one more place with multiple names. With most people I've discussed that trip, I've used the name "Wolkenstein", which Dopplr expands to a long dual name, "Selva di Val Gardena - Wolkenstein in Groeden". Better than just Selva, but still, not what I would pick myself. + Great not to have disturb them with questions on "when are you where"
- Irritating that Dopplr converted "Helsingfors" (which is how I refer to my birth town) to "Helsinki"
- Irritating that Dopplr converted "Wolkenstein" to the very long "Selva di Val Gardena - Wolkenstein in Groeden"
Will I have any real benefit from entering past data from years before 2008? Will there be an easy way to enter many past trips in batch, e.g. over email? When will fellow travellers allow me to see their travel plans? Should I enter "travel tips"? Will I find some benefit from using the data entry from my mobile phone or Twitter? All in all, Dopplr was a very positive experience, and I do expect to manage my travel in it, and get lots of good vibes from it going forward. Some of us use TripIt (www.tripit.com) as a Web 2.0 social travel network, you might want to check it out and compare. It's great for organizing your own trips, at least, as it reads and understands E-mail booking confirmations from lots of web sites, travel agents, etc. I have found it very useful so far.